The second thing, you will be isolated from OS. You will not think about how the operating system launches your apps, how to close etc. Actually, it doesn't matter. I agree that in every activity you can dig as deep as possible, and Android development isn't an exception. Nevertheless, it's not absolutely obligatory to know these details to create beautiful and amazing apps. In backend development, you have to know, for instance, how to install packages in Linux, how to set environment variables, how to run your applications, how to launch аn app as a service etc. Also if you don't have special people for it (they are called system admins or DevOps), it will be nice to know how you plan to update your application without downtime, migrate data, how services interact with each other. You can trust me, you will have to know all these things. Maybe I am mistaken, but mobile development strikes me easier than backend development. The third thing, you can share it with your friends, parents, and others. All these people don't have to be programmers to understand and appreciate your work result. You just create an app, upload one to Google Play or just sent it to someone, install it and it's all. Everybody can see it, touch it, and use it. If you were a backend developer, you would create functions, modules, services. You couldn’t show your work, maybe, only to other programmers like you. These abstractions aren't comprehensive for the average person. It's happiness to create something and share one with somebody. Mobile development gives you this opportunity in the extremely easiest way. The fourth thing, creating mobile apps is actually funny. Android OS provides API for doing a lot of things. You can get access to a The fourth thing, creating mobile apps is actually funny. 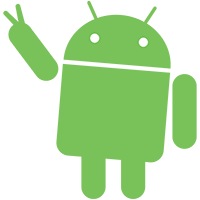 Android OS provides API for making a lot of things. You can get access to a camera, GPS, gyroscopes, microphone etc. It gives you a lot of opportunities, which are limited only by your imagination. Also, you can create an app, which you can install on your smartphone and use every day. To my mind, it's perfect experience and good basics to continue improving.